Algae filtering power is well known, provide enough light and nutrients, and algae will grow quickly to almost exhaust them, leaving a clean and pristine water. 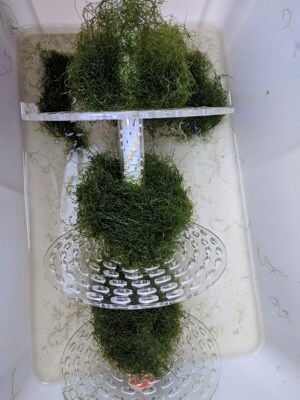 It is and old idea: let's place some fast-growing algae, for example chaetomorpha or caulerpa, in a recipient with a strong light and a closed water loop from the tank; inorganic nutrients in the output (NO3 and PO4) will be lower than the input ones, until after many cycles an equilibrium is reached. If you keep on providing nutrients (food and fish poop, decomposing matter, supplements…) algae will continue growing until the time in which they should be partially removed come (harvest), but if nutrient input stops algae growth will slow down until they eventually disappear. The advantage of a reactor of algae is the ease to control the level of inorganic nutrients without depleting them completely, as it might happen with other biological filtration methods (for example the so-called probiotics which base their efficiency on the massive reproduction of bacteria by adding carbon sources and their export by the usage of a skimmer). Alright, but this is old stuff, What is new? 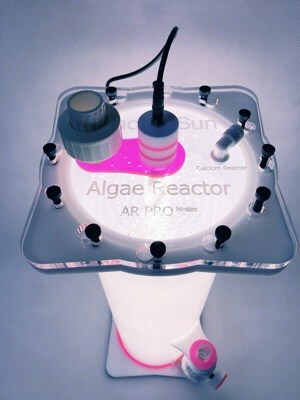 Algae Reactor is the first device that incorporates a port for connecting a calcium reactor. In this fashion we can bring in water with CO2 thus getting algae to grow much faster and more vigorously. Another advantage deriving from this is that we can remove part of this CO2 before it reaches the aquarium and thus lessen the usual pH drop in aquariums that are equipped with a calcium reactor. Chaetomorpha is very a very popular seaweed among hobbyists because it is a fast grower and minimally invasive . Traditional algae farming in the sump with these intricate species often involve that both flow and light in the innermost areas of the mass are barely enough and fail to develop their full potential. On the other hand, if there is not enough flow they tend to accumulate sediments and debris, which eventually impoverishes water quality. I have found that growing chaetomorpha inside of Algae Reactor is much more efficient since both light and nutrients better reach all areas. Algae in a reactor not only grow much faster, but they do with greater vigour which can be verified by its color and texture. The first thing we observe is that Algae Reactor is a solid device, entirely manufactured in acrylic and PVC, with generous thicknesses that give the same feeling of robustness as other products from the Polish manufacturer. This equipment consists of a tube of translucent acrylic (is manufactured in three sizes) with a flat base and a top opening by where a single piece is inserted to close it. This piece is formed by a transparent lid fixed to a concentric transparent pipe where the lighting system is housed in. 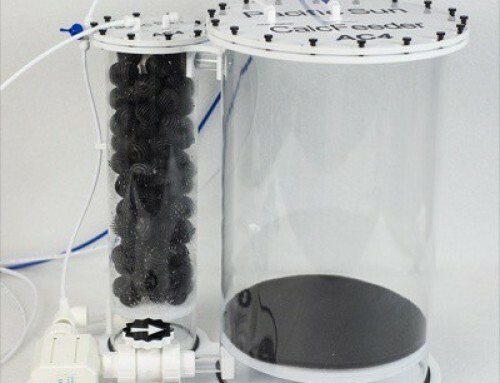 For user convenience, the Algae Reactor incorporates four perforated trays (which can be moved in both directions enabling optimal management of the internal space). The lid is sealed by nylon screws on several slotted holes without nuts and being a device that does not work under pressure, a few turns are enough to ensure tightness. All models of Algae Reactor are identical, changing only their size and thus their capacity for algae storage. In all of them we will find four perforated trays where we can easily set the algae and in all of them the water inlet is through a PVC valve of 20 mm diameter located in the bottom. This valve is very useful to adjust the flow across the reactor, as well as to shut it completely if we want to open it and withdraw some algae. The water outlet is located at the top, thereby achieving a uniform and upwards flow. So they have endowed Algae Reactor a convenient removable connector, also 20 mm diameter. Being a tight device, we can install Algae Reactor both inside and outside of the sump, although it must be borne in mind that the removal of the trays with algae is vertical. So we will have to leave enough space between the top and any objects that are above, for example the bottom of the tank if we decide to install it under it. If you do not have enough space above Algae Reactor, it is always possible to tilt it sideways to remove trays, algae do not usually topple down even if we tilt it, especially chaetomorpha which grows in very compact blocks. 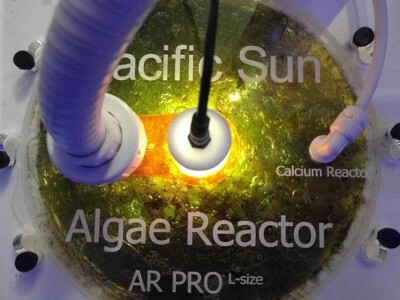 Lighting of Algae Reactor is provided by a strip of LEDs wound spirally in an acrylic tube solidly attached to the lid. As indicated by Pacific Sun, these LEDs are optimized for growing green and red algae, which, judging by the speed at which they grow, seems to be true. These LEDs are connected to a power supply provided with the Algae Reactor using a jack plug. As usual in Pacific Sun's products, the flange at the top of Algae Reactor has a groove where a silicon gasket is firmly located. This gasket fits very precisely so you do not have to worry about it moves every time you open the lid to withdraw some algae. the same type of nylon screw is used in all models , changing only the amount. With this system you can open or close the reactor very conveniently in less than a minute. The Algae Reactor is a device with no nooks or angled areas where debris or dirt can get trapped. 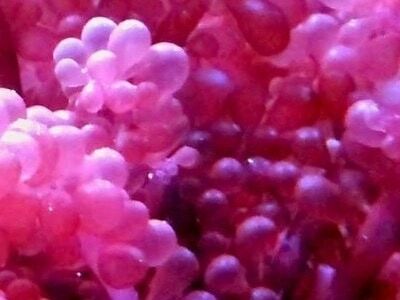 Cleaning is easy and fast, for example, if you want to remove coralline algae incrustations. If what we want is to clean the aquarium water and reduce inorganic nutrients like NO3 and PO4, the use of algae as chaetomorpha is a great choice because it grows fast (and therefore absorbs more nutrients) and it gets more compact than other algae without affecting their integrity. This also allows some flexibility when harvesting this algae. Between the following images there is about one month. Both design and construction of Algae Reactor seem to be excellent , although there are a couple of things that I think could be improved. 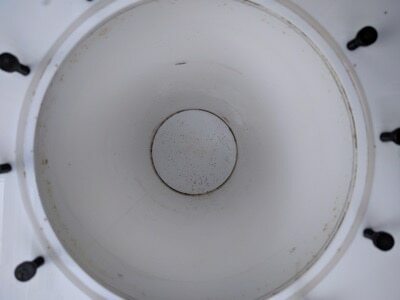 The connector for the calcium reactor effluent is at the top. I doubt that the calcium reactor water is distributed properly inside the Algae Reactor. I think this would improve significantly if the connector is located in the reactor's inlet. 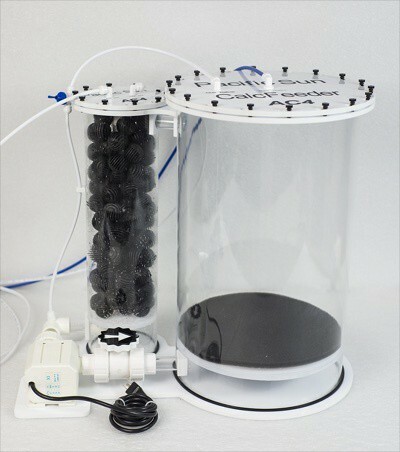 As I mentioned above, the Algae Reactor It is a device that can be installed inside or outside the sump. If you install it outside the sump, you need to drain some water before opening and lifting the lid to avoid spilling it on the floor. For this reason it would be convenient to install a small drain valve at the bottom of the reactor; or even drain it through the calcium reactor's pipe if it was located on the inlet pipe as suggested above. Undoubtedly one of the most popular algae, the chaetomorpha is characterized by moderate to fast growth, stability and absence of roots. This makes it be a little or nothing problematic species since it does not release gametes as caulerpa nor it is an invasive species such as bryopsis. 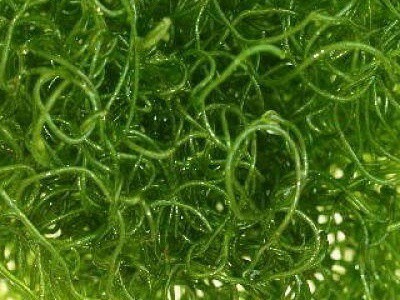 One might think of chaetomorpha as the ideal species to use in the Algae Reactor and so it is, in my opinion. That does not mean that other types of algae may be grown, especially if we want to use this device as a source of natural food for our fish or even ourselves. 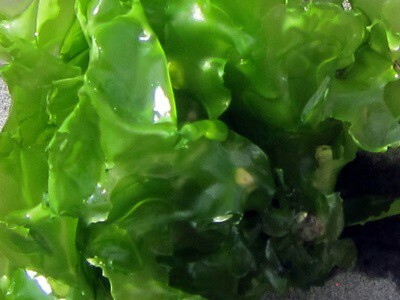 Known as sea lettuce, It is a medium-fast growth algae appreciated by fish, so it is difficult to maintain in the aquarium. 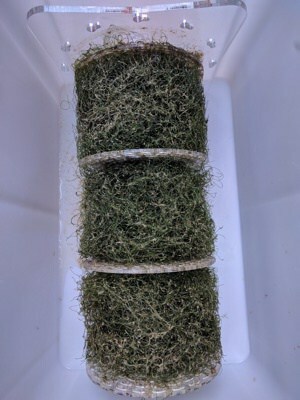 It grows better with moderate light so if you want to grow in the Algae Reactor you should put it on the outermost part of the cylinder, where it will get less light. It is a very decorative red algae with orange highlights. It grows slowly and except for the tender shoots it will be usually respected by fish, so it can be grown in the Algae Reactor and transferred to the aquarium once it reaches a certain size. Its lighting needs are not very high so you should place it in the outermost part of the reactor too. 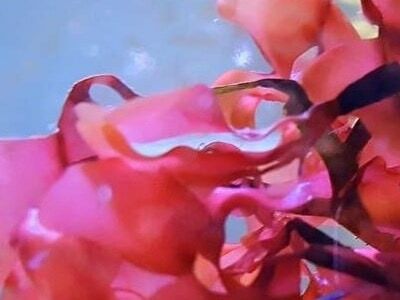 It is one of the most beautiful and appreciated red algae, the only problem is that fish also know it and unlike the previous one they will devour it as soon as it is placed in the aquarium. It grows rather fast when compared with other red algae, but it's no invasive at all. Rootless but it can get to stick to the rock if given the opportunity. It adapts well to different light conditions so it can be grown in the Algae Reactor without any problem, though if it gets too much light its color it will be much paler. 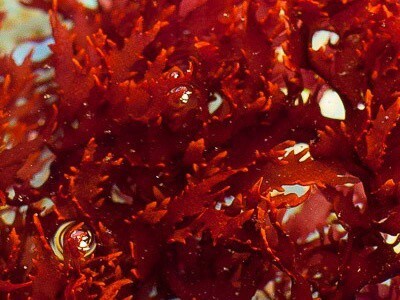 Bunch of grapes-shaped, This red alga does not pass unnoticed. Like the previous one, It is a highly desirable species for most fish, not only herbivores. Its growth is moderate and supports a highly variable lighting but will do better in the outermost part of the Algae Reactor. It has roots either but it comes to stick to rocks if given time and the current is not very strong, and can be an excellent decoration for a seahorse tank. I have spent many years cultivating different types of algae both in the aquarium and sump, This is the first time I grow them in a specific reactor. Some of the things I've experienced in the recent weeks make me glad to have installed it. The water seems to be much clearer, although I have not witnessed an important decrease in nitrates or phosphates (hey remain around 10 ppm and 0,06 ppm respectively), but corals are more open and healthy. It may be attributable to pH stabilization which no longer goes under 8,1 even at night (I use the reactor in inverse photoperiod). This chaetomorpha and caulerpa grow much faster and with better color than when grown in the sump and I can finally grow red algae without been eaten by fish, which I feed at least once a week with any of these algae. There were little tufts of filamentous algae in some areas of the aquarium, nothing important, almost imperceptible but they would not disappear and if I removed them they'd grow back. These algae have completely disappeared, possibly by competition with the ones growing in the reactor (at the level of certain nutrients), although I stick to the usual water changes routines. I can not deny that I am very happy with the performance of Algae Reactor and would not hesitate to recommend it to anyone who reads this article: the posibility to control the nutrients in a natural way, the stability achieved in the pH of the aquarium water and the availability of fresh algae to feed the fish are the main reasons for this.